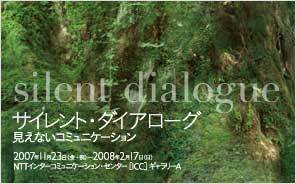 Silent Dialogue at the ICC, Tokyo: "
Currently at the NTT InterCommunication Center[ICC] in concrete-laden Tokyo is an exhibit devoted to nature’s inter-relationships within the ecosystem we share with plants and animals. Focusing on the interaction between plants, animals and humans, or this ‘invisible communication’ of nature which our senses might not always perceive, the works in the Silent Dialogue exhibition exhibited make those signals visual and audible through the use of biosensors as well as other algorithm-based software programs. Relying on such simulations, the works on display are a true fusion of science, design and art and provide a glimpse into the secret lives of plants while revealing more about the human effect and affect within the ecosystem we share. Investigating how plants, animals, or insects communicate and behave offered new perspectives to the effect of making us more apt to the signals our environment sends in an era of increasing interaction from humans and technology. Call <-> Response by Tanaka Hiroya and Cuhara Macoto (who are working under the collaborative title, tEnt) simulates a natural environment for birds in an effort to derive and explore how they communicate. Attempting to communicate beyond human language, the software was designed to record, generate and layer simulated bird calls. 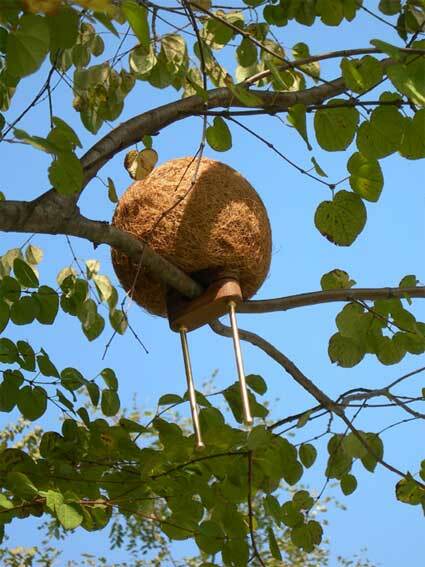 Here, the coconut shell is fitted with a small speaker which emits varying bird calls via a continuous algorithm-based signal. One of the most interactive works displayed was Bio Photon: Allelopathy by Ando Takahiro. As plants germinate and grow, photons are emitted from their leaves. 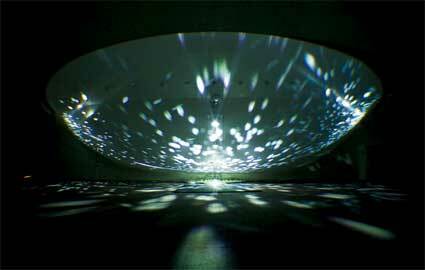 They are invisible to our eyes but in his work Ando work visualizes the amount of photons via the discreet sensors which results in a hyper-sporadic display of flickering lights across the dome at light speed, if you will. Ando has intentionally set up two electric-current-generating for us, which upon touching, allow us to feel the currents that we couldn’t otherwise visualize. Dogane Yuji, a botanist who has focused his research on orchids, collaborated with composer Fujieda Mamoru for Paphio in My Life, where the inaudible sounds of plants are picked up by connected wires then converted to manifest a plant’s ‘voice.’ As plants respond to environmental stress, simulated by varying vibrations induced by the artists’ algorithmic program, the plant’s ‘voices’ vary accordingly. By broadcasting such a dialog, Dogane hopes to bring us closer to plants through this glimpse into their life. 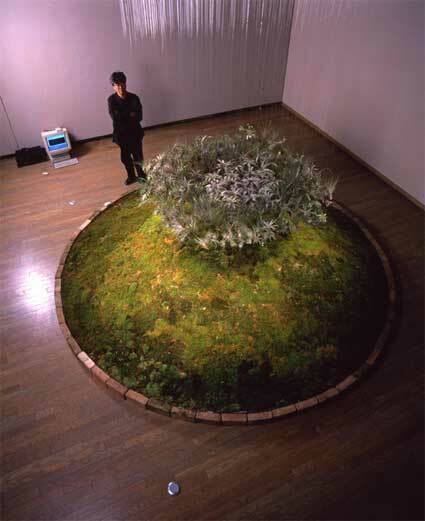 In Orchisoid 03, Dogane Yuji worked with renowned digital media artist Fujihata Masaki (some of his previous works include Unreflective Mirror and Beyond Pages) to better understand adaptation and homeostasis in plants. For this project, several orchids were again wired and set to experience a variety of vibrations from the shifting table they rest upon. The artists concluded that the physiology of the plants changed the same way as human brain wave patterns change in response to stress. And because the orchid’s wave-activity fluctuates in real time, rather quickly, Dogane recognized it as a sign of high-level information processing. 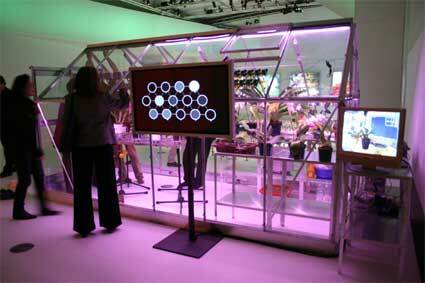 Also on display were Christa Sommerer and Laurent Mignonneau's installation Interactive Plant Growing from 1992. 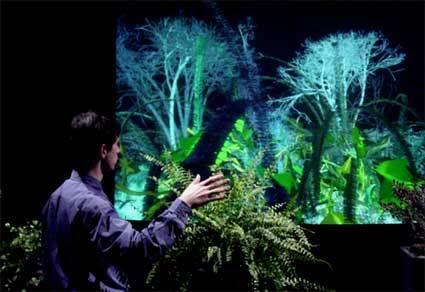 Touch the plants and watch the screen fill up with a digital cascade of the plant’s leaves; still a great example of physical action into digital realization. 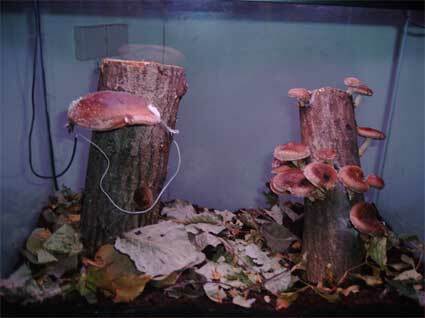 For a glance into the secret lives of mushrooms, Michael Prime affixed bio-sensors to various kinds of locally grown mushrooms to reveal a dialog we perhaps thought never even existed. From their docile setting in an aquarium, the bio-receptors broadcast the sounds of pulsating waves of noise through speakers in the installation space. The result- a surprising continuous drone that shifted tones rather sporadically revealing a brash, trance-like state of mushrooms- fascinating, surreal and surprising. Until February 17, 2008 at the NTT InterCommunication Center[ICC]. All images Courtesy of ICC. Most of us have no doubt that our fellow humans are conscious. We are also pretty sure that many animals have consciousness. Some, like the great ape species, even seem to possess self-consciousness, like us. Others, like dogs and cats and pigs, may lack a sense of self, but they certainly appear to experience inner states of pain and pleasure. About smaller creatures, like mosquitoes, we are not so sure; certainly we have few compunctions about killing them. As for plants, they obviously do not have minds, except in fairy tales. Nor do nonliving things like tables and rocks. Continue reading: The Way We Live Now: Mind of a Rock: "Is everything conscious?" The Bat House Project competition ended recently and the winners have been announced. Good to see bats regaining some habitat. Invention: Microsoft mind reader: "This week's patent applications include Microsoft's plans to read your thoughts, a metamorphic amphibious vehicle and a wearable medical sensor network.